Only those who have been totally blocked-out from all media sources over the last year would wonder what an iPhone is as the so-called “Jesus Phone” has been in the mainstream headlines since even before it was officially unveiled in January. However, for a combination of reasons, there has only been mild speculation about when – or indeed how – it would become available in the Japanese market. Citing the initial lack of 3G capability, not too mention an ‘unusual’ operator revenue share arrangement, the story so far has centered around deployments in the US and Europe. 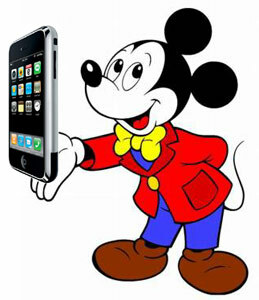 We noted here on Wireless Watch last week that, “SoftBank and Disney have come to terms on rolling out the long-awaited Mickey Mouse MVNO in Japan.”, and it would seem – as speculated then – the iPhone could very well play front and center role in their plans. Looking beyond whois on their board of directors, a handset deal tied to revenue share from the traditional operators would be a ‘difficult’ proposition in Japan. With a dozen OEM’s here who have long-established carrier connections, such a move would — shall we say — set a rather disruptive standard going forward. However, an MVNO like Disney should have a little more breathing space to maneuver and most certainly would love to splash with some glitzy hardware bling in order to attract even more attention. On the content side, Disney has real depth beyond just cute characters.. which are very popular in their own right here. The companies movie catalogue and television inventory via Buena Vista combined with games, music and their Extreme Sports offerings would all display quite nicely on “Steves Amazing Device”. So much for antidotal pondering. How could we come to terms with making such a bold statement, when even the local very well connected tech media has not – so far as we could find – managed to break this news? WWJ subscribers login for the real juice. Of course at this point it’s not likely to get anyone who is directly connected, even off the record, to give us a wink-wink confirmation. Lets just say that certain significant members of the three main parties involved have been spending a few late nights on the Ginza. Considering the small spaces and the fact that certain ‘strangers’ in the room might be more aware than one might think, especially after-hours, suffice to say — sometimes you just get lucky..
From walking around the electronic shops here recently the Apple Touch unit is on prominent display everywhere for a line-up of curious customers to take for a test-drive. The iPhone product, introduced by a trusted brand like Disney, would certainly attract several demographic segments in Japan and we should all know for sure sometime in the coming months.